The recipes inside Gelato Messina's new book The Creative Department are as slick as they are intimidating. What are the chances of creating a successful dessert from a book so focused on perfection? 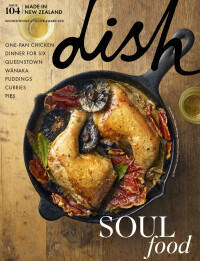 Dish's practical recipe book reviewer David Parker finds out. Gelato Messina is an award-winning Gelatina in Australia. They now have a number of shops and, surprise surprise, their own cookbook! When I told friends I would be reviewing the Gelato Messina book I was met with exclaimations of 'Oooh' and 'Yum' but the only noise emanating from my mouth while looking at the book was “Hhuuurrrgghhhh”. There are so many perfect shiny domes of sweet things, so many chocolate-sprayed, perfectly shaped treats. So many complex feats of dessert, I wasn't sure I could be bothered... It's just ice cream right? I couldn't pick a recipe so I got a friend to choose for me. She suggested Honey I Burnt The Kids – a burnt vanilla gelato, with burnt honey mousse, smoked chocolate fudge sauce and smoked popcorn. It sounded interesting and looked easy... Well, easier than most of the others. I've been thinking recently about what could be the 'salted caramel' of 2016 and I think something smoked or burnt could be a contender, maybe it will be burnt vanilla? The one vital piece of equipment I didn't have, which would make almost all of the recipes in the book impossible, was an ice cream maker. An ice cream maker is one of those things you buy and think: "This is going to be great, I'm going to make fresh ice cream and sorbet and gelato all the time!” But you use it once and then it takes a large amount of space in a cupboard somewhere until you donate it to an op-shop. Or, your recipe-reviewing friend tweets he would like to borrow one for an impending recipe review and you kindly allow him to take it off your hands for a week or two before it goes right back to filling that cupboard. With my ice cream maker collected I was ready to start making gelato and various other toppings. I started by "burning" the vanilla paste. The vanilla paste was really runny, more like a syrup than a paste. I thought I had bought the wrong thing and it wouldn't burn as it was so liquid, but after 10 minutes in the oven it had bubbled up and was smoking. There were only so many times I could bear being told by "helpful people" that “the thing in the oven is burning” before I decided it was burnt enough. Then I ground the burnt vanilla paste in a pestle and mortar and added it to the other dry ingredients for the gelato; sugar, maltodextrin (a sweetener made from modified corn starch) and skim milk powder. I didn't have time to order the 3.5 grams of gelato stabiliser from a specialist supplier but if you were going to make lots of recipes from this book, it's probably worthwhile. Then I put the milk and cream in a bowl over a pan of water on the stove and slowly brought it up to 40°C before adding the dry ingredients and 30 grams of egg yolks (which turned out to be about one and a half yolks). Then I brought the temperature up to 65°C and whisked for about 25ish minutes until I got bored and couldn't be bothered whisking anymore. Is anyone going to actually whisk this for half an hour? At the halfway mark, buying a Thermomix, as suggested by the book, was starting to sound appealing. I put the gelato mix in a bowl over an ice bath to cool quickly before being left in the fridge to further chill. The smoked chocolate fudge was so simple to make; I heated cream, dextrose, liquid glucose, vegetable oil and liquid smoke in a saucepan to 85°C. Then I took it off the heat and added the dark chocolate and stirred until it was melted. Then I blended it with a stick blender. So easy! Once the gelato mix had cooled for a couple of hours it was ready to churn in the ice cream maker and I left it to get on with doing its thing for about half an hour, when it was ready to transfer to the freezer. Then I started the burnt honey mousse, first leaving some gelatine to soften in water and then whipping two-thirds of the cream until soft peaks formed before setting aside in the fridge. Then I "burnt" the honey by heating it with sugar until it started to darken and smoke. I added the butter and milk to the honey which bubbled up like making a caramel, but the milk and butter seemed to split and the mixture looked a bit gross really. I forged ahead, adding the gelatine and dextrose and then I removed it from the heat and left to cool until it was at 60°C, which is when I whisked in the egg yolks. Then I left it to cool in the fridge. The last element to prepare was the popcorn. After cooking I drizzled over a mixture of melted butter and liquid smoke. For those wondering, liquid smoke is the flavour that smoking brings in a liquid form. It smells very intense, but there are lots of possibilities for bringing that smoked flavour to dishes if you don't have a smoker or adding a smoked flavour to something that would be difficult to smoke otherwise, i.e. popcorn. When it came time to put the dish together I grabbed a mirror, wiped it clean and nervously piped the gelato with a piping bag. It looked perfect. I had a different tip on the mousse piping bag, a little bigger but it should be okay. I began to pipe and a solid log of mousse dropped out of the bag onto my perfectly piped cone of ice cream. There was definitely something wrong with the mousse. For the sake of the photo I decided to pipe the mousse first, then gelato and then add the fudge and popcorn. It's not perfect but you get the idea. Now to the important part: the tasting. No one liked the smoked chocolate fudge sauce, saying it tasted like chocolate barbecue sauce, but in a bad way. While I wasn't as disparaging I had to agree. It somehow worked in the context of the dish but it was kinda oily and I don't think the smoke and chocolate worked together. The really cool thing about it was it went hard on the gelato just like ice magic chocolate sauce! The burnt vanilla gelato flavour was good, but its texture was a little gritty – would a better ice cream maker and the special gelato stabiliser have helped? Probably. The popcorn was good! The burnt honey mousse was just bad. Horribly sweet, not really any burnt flavour that I could tell so maybe I didn't burn it enough but the texture was just gross. Imagine eating a mousse that you had to chew and that about sums it up. I ate a serving worth for the sake of the review (everyone else turned their noses up at it) and the rest ended up down the sink. Hopefully we don't have to call a plumber. The book does mention that because the recipes have been scaled down from their commercial scales some of them might make more than you'll need of a particular ingredient so that the recipe is still easy to follow and you're not weighing out half grams of ingredients but we had so much leftover unwanted chocolate fudge sauce and maybe the 10 grams of gelatine in the mousse is a mistake from a scaling down calculation, I can't be sure. Level of expertise required: Unless you're a pastry chef most of the techniques are probably going to be out of reach, or the techniques aren't out of reach but the standard of execution is. Who has a chocolate sprayer in their kitchen? Or all the ridiculous little moulds. I think the recipes aren't that complex really but it's all the presentation that's difficult. How many trips to the supermarket required? If I didn't already know where to find maltodextrin and liquid smoke and dextrose, I'd have been seriously scratching my head with this one. There are quite a few special ingredients and I'm sure they won't be easy to find. How closely did the dishes resemble the pictures? 5/10. I chose one I knew I'd be able to make look about right but there is no way I would be able to make all the shiny perfect things in this book look close to the photos. Ease of reading: The recipes read fairly east and are simple to follow but some of the diagrams of how the individual elements are put together aren't very clear. Pretty on the coffee table or designed to be battered through overuse? If you just been given an ice cream maker for Christmas and you're desperately trying to make sure it gets used and doesn't just spend the rest of its days taking up space in a cupboard this isn't the book for you. I'd leave this one on the coffee table. Although I guess you could use the recipes and just eat them maybe not plated up so fancy – after all, when I served myself Honey I Burnt The Kids I just put all the elements in a bowl and it still looked quite nice. Written by Nick Palumbo and Donato Toce. Published by Hardie Grant Books, RRP $55.